Looking at last weeks Q2 2014 production data release from the Ohio DNR we can see where most of the oil is coming from out of the Utica in Ohio, both in cumulative production and production per producing day. Table and maps below. While looking at the data it is important to recognize the fact that counties like Carroll have far more wells, and wells that have been producing longer, so higher total production is not a big surprise. Newer wells will show higher production in the early months then later drop off sharply. Noble stands out as a county with the highest production/well or per producing day on the average for the quarter, and though Noble's wells are newer and higher production/day is expected, the new wells in Noble seem to be producing at higher initial rates than early production of Carroll County wells. 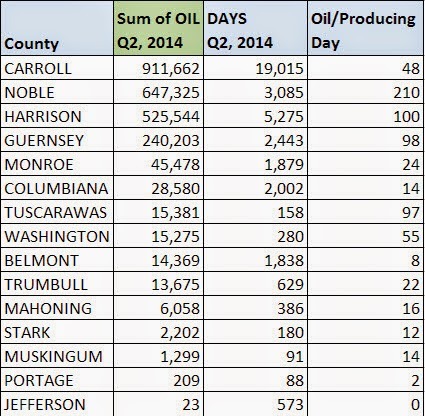 As a result, Noble County continues to be a standout in oil production in the Utica Shale in Ohio. Darker shaded counties indicate higher production per producing day, click county to view numbers. Production numbers for individual wells in any of the counties can be seen here.